Editor/Author Bard, Allen J., Stratmann, Martin and Calvo, Ernesto J. This comprehensive reference provides all the pertinent information in the field of electrochemistry. Practical and easy-to-use, this is the first and only reference dedicated solely to this field. 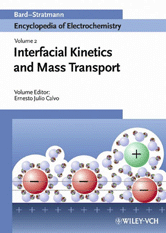 Interfacial Kinetics and Mass Transport covers topic including: transport phenomena, spectroscopy, structural relationships, and kinetics.